Carrie started with our office right out of hygiene school in 1999. She attended UC Blue Ash Dental Hygiene program. 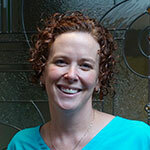 She has developed many close relationships with her patients over the last seventeen years. She and her husband Brandon have two young children and two large dogs.